Last night I had a little attention on whether or not a bear would be visiting again. I thought I’d given my BEAR AWARE book away because I could NOT find it. Not sure how I lose anything at all in this small space! Today, while getting the Dirt Devil out I found my book. Whew. The percentage of people that have no idea what to do when a bear comes to their site is surprising. I mean, I had no idea and have asked Randy to pop-quiz me during the day just so I don’t freeze up. I did read about it earlier but I guess I just forgot plus if you don’t use something regularly there is just no reason for your brain to keep it in the cache right near other important things (like the billions of passwords we are supposed to remember along with our usernames!?!?). Thankfully we had NO BEAR VISITS last night. I still didn’t sleep great worrying about all of our campers. When we got this job I immediately tried to get a feel for what and where we were going. I had not been to Lake George and never visited Mammoth Lakes in the summer. 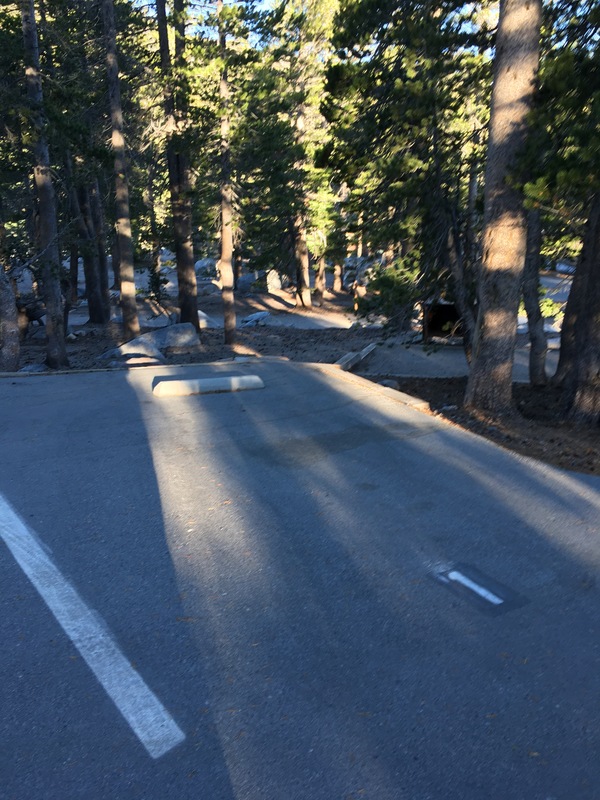 My winter visits were also limited to the road to Mammoth Mountain and the rental condo we stayed at…and the visit to the grocery store. Our visit in April was a bust because the place was still under 20 feet of snow. We did have an incredible trip, met our Operations Manager and the Camp Host that had taken care of Lake George for (I think) 4 years in a row. Because I couldn’t find anything it dawned on me that a little photo gallery plus description of each site might be helpful. So, here we go! The campground sites are on a loop. They are nicely spread out yet close enough to the two restroom facilities (no shower) which are kept extremely clean. 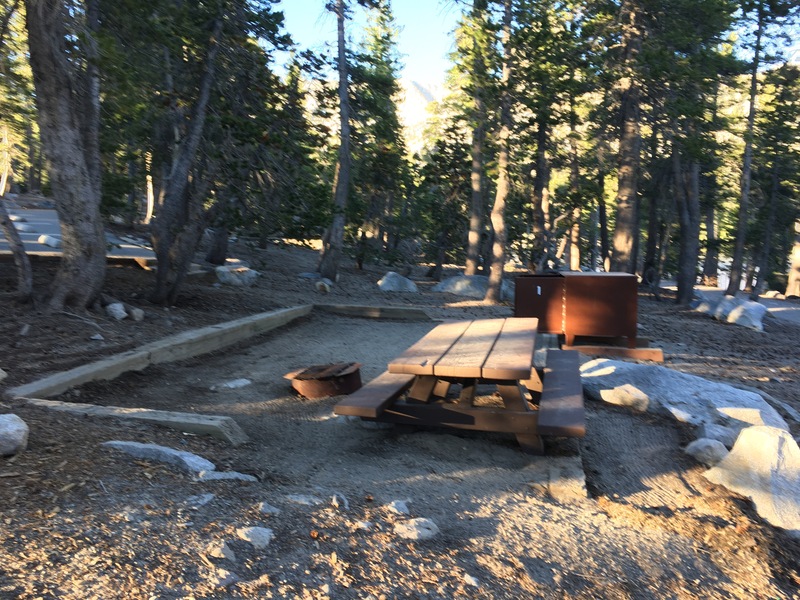 Right outside of the campground is Day Use. This fills up quickly with people out to fish mostly. I’ve never seen so many fishing rods! 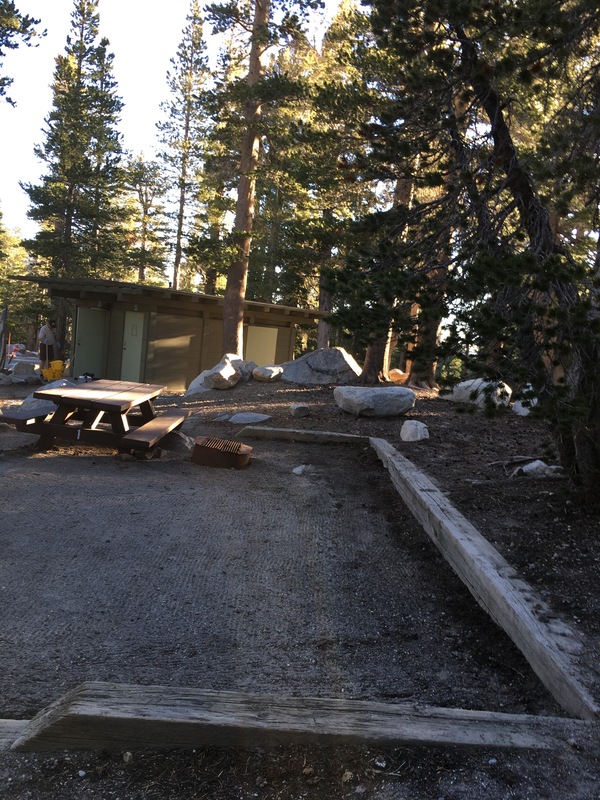 Day Use has a restroom but the people always seem to use the one meant for the campers. It is plumbed and the other is not. The Campground restrooms have no electricity, so bring a flashlight in the evening. Nearest to the restroom (about 30 yards) this site has the closest access to the actual lake. 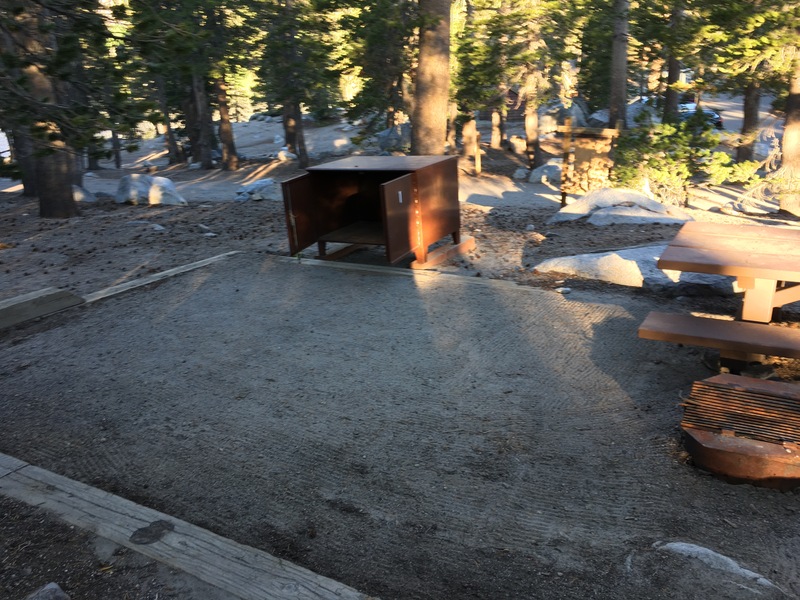 There is a picnic table, fire ring, giant bear box and very manicured space for a tent. The space is large enough to have a few lawn chairs which are critical for full relaxation! You can also see the sky clearly at night and take in the magic as comets whiz by. A view of the site from the entrance area. Bear box. PUT EVERYTHING WITH A SCENT IN IT! Chapstick and make-up included on that by the way! 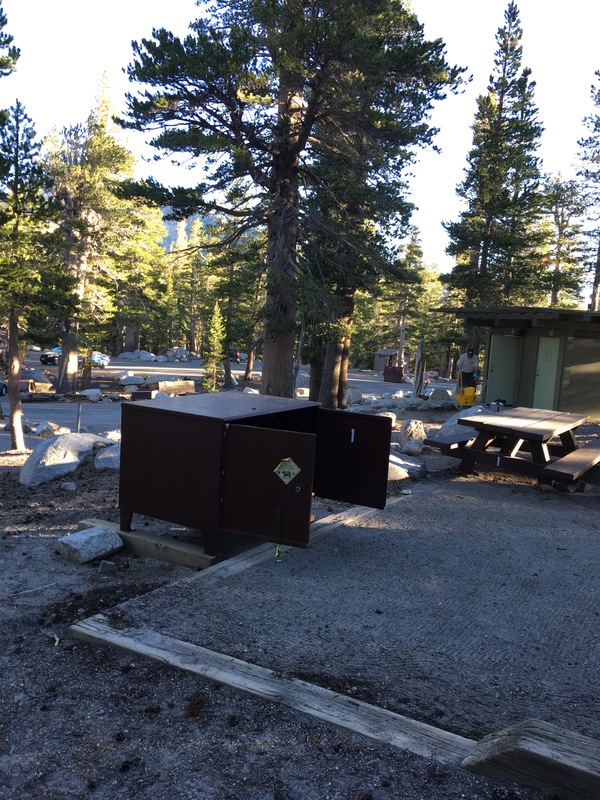 OH AND CAN YOU HELP SPREAD THE WORD: Lake George at Mammoth Lakes is OPEN! You do make it sound wonderful except for the bears LOL!!! I’m really hoping that soon a trip will be planned and we will head there for a long weekend. I love Mammoth Lakes! Your story and pictures are the only things that make me want to come camp there! We are not hige campers but that’s going to change soon! Is Part 2 ready yet??? Can’t wait!